With a stay at Chateau St Gerlach in Valkenburg aan de Geul, you'll be in a regional park, within a 15-minute drive of Market and De Valkenier Amusement Park. 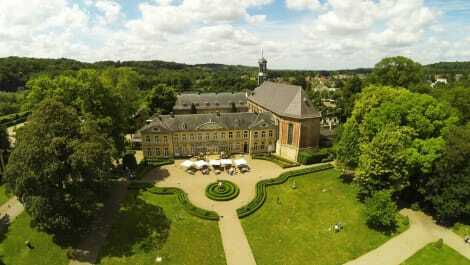 This 4-star hotel is 7.4 mi (11.9 km) from Vrijthof and 8.3 mi (13.4 km) from Maastricht University. Atlas Hotel is centrally located in Valkenburg. From the hotel you can easily walk to the shopping streets and museums. Maastricht is 14.7 km away and Aachen is 26.9 km from the property. All hotel rooms have a private bathroom. In the morning a breakfast awaits you to start your day at ease with glutenfree and vegetarian options. Atlas Hotel features an à la carte restaurant. The menu is adapted to the seasons and offers plenty of variety for a tasty evening meal. A bar and lounge is available for a drink, which you can have outside on the terrace as well. Valkenburg is a tourist city to spend a few days in. Furthermore, you can visit the local caves. Valkenburg is located between Maastricht and Heerlen and close to both the German and Belgian borders, which gives you the possibility for plenty of trips. Valkenburg station is a 3 minute walk from the property, the city centre is a 1-minute walk. The on-site parking is also available for bikes. Palanka is located in the centre of Valkenburg, just 1 km from the train station. On-site facilities include a heated indoor swimming pool and free Wi-Fi. Thermae 2000 can be found within a 10-minute walk. Rooms at Palanka are simply decorated and are all different from each other. Equipped with a flat-screen TV set, they all feature a spacious en-suite bathroom. Guests can enjoy a daily breakfast with fresh bread and rolls. On warm and sunny days it is possible to sip drinks from the bar outside on the terrace. Dozen of local restaurants and bars are a 3-minute walk away. The Palanka is located a 15-minute drive from Maastricht and Heerlen. Guests can enjoy walk in the surrounding area or take a short drive to the Belgian border. Bicycle storage is possible on site. Situated in a monumental building designed by architect Pierre Cuypers, Parkhotel Valkenburg is 300 metres from the city centre. Guests benefit from free access to the gym and a wellness area with an indoor pool. Free high-speed Wi-Fi is available throughout. Parkhotel Valkenburg offers newly-renovated rooms with a flat-screen TV and a private bathroom. They have offer views of the scenic surroundings. The restaurant is situated in a former monastery and has a terrace with views of the hills around the hotel. It serves French cuisine and an extensive buffet breakfast every morning. It includes different kinds of bread, organic tea, Prosecco, yoghurt, muesli, fruits and eggs. Parkhotel Valkenburg also offers several services for cyclists: modern bicycles, free cycling routes, a secured bicycle storage, a cleaning station, GPS rentals and pasta meals. A regional expert is available to help guests plan their day trips and answer questions about the area. Maastricht and Aken are both 20 minutes away by car. Golf and Country Club Hoenshuis is 8 km away. Hotel Riche is located on the edge of Valkenburg aan de Geul, 200 metres from the city centre. The hotel has an on site restaurant. The guest rooms of Riche offer a private bathroom and a TV. Breakfast is available daily in the restaurant, but can also be room serviced. Guests can enjoy a mix of Dutch and French cuisine in Restaurant Riche. Meals are prepared with fresh and mostly seasonal ingredients. Brasserie Nextdoor is situated at the other side of the street. The Riche Hotel also offers bicycle storage and has private parking facilities. There is a lounge bar for drinks. Riche Hotel is located a 15-minute walk from the train station of Valkenburg. The Thermae 2000 wellness resort is just a 10-minute walk away. This family-run hotel in a building from 1800 in Valkenburg centre, offers free Wi-Fi throughout. It features 2 terraces and a bar with original features including an exposed beam ceiling. The Hotel Scheepers is situated in a quiet neighbourhood, great for your good night’s rest. At the same time, the centre and the bus stop are both only a 2-minute walk away and at 5 minutes walking distance you’ll find a forested hiking area. All of the rooms have box-spring beds, a flat-screen TV and modern bathrooms. Some rooms have a bathroom with a spa bath. A breakfast buffet is served in the morning. Climate control is featured throughout the hotel. Make use of the paid private parking facility to ensure that your car, motorbike or bicycle is secure. lastminute.com has a fantastic range of hotels in Valkenburg aan de Geul, with everything from cheap hotels to luxurious five star accommodation available. We like to live up to our last minute name so remember you can book any one of our excellent Valkenburg aan de Geul hotels up until midnight and stay the same night.